MATT GLOWACKI: This is Matt Glowacki, and I am a disability advocate and professional speaker all around the United States, and this is your Assistive Technology Update. JOSH ANDERSON: Hello and welcome to your Assistive Technology Update, a weekly dose of information that keeps you up-to-date on the latest developments in the field of technology designed to assist individuals with disabilities and special needs. I’m your host, Josh Anderson, with the INDATA Project at Easter Seals Crossroads in beautiful Indianapolis, Indiana. 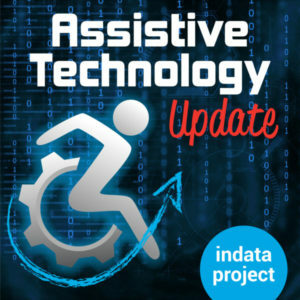 Welcome to episode 400 of Assistive Technology Update. It’s scheduled to be released on January 25, 2019. We are very excited to have Matt Glowacki on to talk about the Americans With Disabilities Act. Let’s go ahead and get on with interview. Folks, we don’t ever discuss politics on this show. If you have access to news in any medium can you are inundated with politics and political opinion constantly. We try to remain a passion of solace from such things. With that being said, America’s 41st president, George W. Bush, passed away in November. Whatever your opinions are of them as a president or his policies, he did one thing that affects us all every day: he signed the Americans With Disabilities Act into law on July 26, 1990. While this law did not fix everything having to do with access, every move in the right direction does get us a little bit closer to the gold. So our guest today is Matt Glowacki. Matt is a renowned public speaker. He has only three businesses, work for Fortune 50 corporations Participated in the Paralympics, and is the most the book to diversity speaker in the college market. He’s been honored with a variety of awards and shared his ideas and experience is with millions of folks across the US. Today he was nice enough to come on the show to share his experiences of living in the world changed by the ADA. Matt, welcome to the show. MATT GLOWACKI: Thanks a lot for having me. I really appreciate it and I’m really looking forward to talking about the ADA. It’s something I use every single day, and it’s so great, I even forget that it’s there sometimes. JOSH ANDERSON: That’s great. I guess that’s great. Start by telling our listeners a little bit about yourself. I give you a little bit of an intro by left a lot of stuff out. MATT GLOWACKI: You did a lot of the heavy lifting. And we give a little bit more of the visual representation of what I am. I’m a double amputee, but I really don’t like to say double amputee because I was born without any. I kind of did it the easy way. No one really knows I was born this way. It was just something that happened. I’m a person who used prosthetics what I was a child because everybody thought it was the right thing for me to do. But the overall length of the leg that I do have isn’t a long enough to be an effective lever inside of the prosthetic. So I chose to use a wheelchair ever since the ninth grade and it’s been working out great for me. One of my businesses is I helped design and manufacture custom-made wheelchairs. I’ve had the pleasure of using a pretty sophisticated manual wheelchair that is perfect for me. That seems to be the mode of travel that I enjoy the most and I take advantage of every day. JOSH ANDERSON: Some time that we may have you on to talk about those wheelchairs, because within assistive technology, that’s one of the main pieces we think about. But what I really wanted to talk to you today is about the ADA. If you can start, and I don’t know how old you are and don’t want to date you or anything like that, but do you remember life before the ADA? MATT GLOWACKI: I do. I always say 91, but I know it was 90-91 that was the year I graduated from high school. I’m 45 years old, so when I think of it, I’ve had two lives. I’ve had one life before the ADA in one life after the ADA. Boy those lives sure do look different. JOSH ANDERSON: I don’t know the best way to start this, but what was life like before the ADA? I know at the time there was nothing to compare it to, but looking back, what was the first big change that you noticed? MATT GLOWACKI: What happened was I started to be able to use public restrooms. I know it sounds a little basic — and I don’t mean to be basic — but I have to tell you, if I talk about basic things we have to do as human beings, I don’t know that there is something that everybody engages in a little bit more than that. As a child, I always thought if we left the house, I would have to have at least three places that I would know that I would be able to go to the bathroom every single day. The first one was my parents house. The second one — I hate to say it, but even back then McDonald’s was ahead of the curve. Most McDonald’s has a larger stall, so my parents and I always knew that we could rely on a McDonald’s is a place that would be big enough to get my wheelchair in. I would always be able to close the door because the innovation of a door closing in word vs. outward was prevalent till people figured out that it would be nice if I could get into the bathroom and not have to show everybody exactly how the bathroom thing works for me. But that was it. The third one would hopefully be a friends house or if it was at a mall or something like that, hopefully will be able to find it. One of the things I always remember that was difficult for me, whether I was using prosthetics or the wheelchair, do you remember the airlock doors that used to be on every single public bathroom? You would walk in and there was a little room, maybe six or 7 feet, and you would have another door that you have to go through in order to get into the bathroom quit do you remember those? JOSH ANDERSON: I do remember those. MATT GLOWACKI: My favorite one is where the door is 26 inches wide and you could barely get in, and once you got in there would be no way that you could open up the next door. Whenever I would have to go to the bathroom, I would always be worried that I would have to work with the airlock doors. That was one of the first things that went away with the ADA that I really noticed. All of a sudden, the bathrooms became accessible and somehow people figured out that you could take the door off the hinges on the second one and still basically accomplish the same purpose of privacy that people were given. That allowed me to have an easier access into the restroom. That was the first thing I noticed, the restroom started changing. And then I started noticing curb cuts. Curb cuts are amazing — and I know they cost a lot of money and a lot of time to do. But what would frustrate me is they wouldn’t do all for if it was a four way intersection. They did one or two and then I would be like this is very nice, and I would get to the other side and I’m like, okay, and I’ll have to run on the road to get to the next driveway in order to get up. Curb cuts were the next thing I noticed. Those were the things I had to deal with the most, actually using my wheelchair outside of the idea that steps were a challenge every single day. Steps are still a challenge except that we’ve got a lot more elevators and ramps and the ADA established the codes for those. What kind of people know, casually, that a ramp should be no more than 1 inch of height per foot of the run of the ramp. A lot of the basic stuff people were never aware of, so the ramps are a lot better now. The easiest things I saw were bathrooms, curb cuts, and then ways to deal with steps. JOSH ANDERSON: I almost had forgot about curb cuts. It seems like something that has been there for so long. Now that you mention it, I can sit and think back when they want there. I remember people going through and making those. I can still go back and remember that. Talking about ramps, when did those start to come into play at places? I know some places still don’t quite have them or have them quite right. When did those start being prevalent? MATT GLOWACKI: People started figuring out that we needed ramps, but they didn’t really know exactly what the angle was that they should use. For the first two years of the ADA, it was kind of like we went down to the Home Depot and bought some lumber and made ourselves a ramp — which is great and I really appreciate it. It was more the people who had a relative, maybe they owned a business and had family member who owned a wheelchair, or basically family members. It was people who saw the problem and then knew there was a solution, and then they put the effort in because they know the law change. A lot of them were handbuilt and a lot of them weren’t real ramps. There was the aluminum ones that truckers have sometimes when they come — just wide enough to have a gurney or two wheel cart run up and down them. A lot of times people would put two of them together and you would have to straddle them to get in. Or people started allowing me to go to the kitchen a little bit more because they knew they had to have a ramp. Now we were authorized to go to the kitchen or the loading docks or whatever. At that point, having wheels on a cart was something that they knew would benefit the business to make everything easier, so they thought we need a ramp, we’ve got one outback so we will just let the wheelchair people use those. That was the first evolution of ramps that I saw that really impacted me. It was people who were trying to do something nice, and then it was people who realize that they had a possible way of accommodating, except it wasn’t through the main entrance or the way everybody else would go through. In my book, I talk about — I call it the 3-2-2-3 rule. anytime there was an afterthought of an accommodation, I know personally that I have two push my wheelchair three times further or work twice as hard to get it, or the inverse of that in order to use the accommodation. When I first figured that out was when I learned I would have to go to the kitchens or utility entrances for all the buildings. That was the first evolution of ramps that I had some exposure to. Again, not that they want a great, but I tell you I’ve gone up some 30° to 45° ramps before. Going down is always more interesting than going up. Boy, I’ve had some pretty scary experiences with ramps. People will say, we’ve got a ramp. And I’m like, yes, but your definition of a ramp and my definition of a ramp might be a little bit different. Obviously it is when they show me. Good times. JOSH ANDERSON: I was going to say, that’s more of a ski ramp, not quite a wheelchair ramp. MATT GLOWACKI: It is. I wish there was a gold medal for going down on ramps on wheelchairs. I would sure be in the contention for that. JOSH ANDERSON: No getting. Since you brought it up to tell our listeners a little bit about your book. MATT GLOWACKI: I wrote a book called “Able-Bodied Like Me.” It’s my story, but it’s not really only my story in terms of what it does for the reader. A lot of times people love to write a biography, and I kind of started out that way. But while I was doing it, realized that my story is not just that I want to tell stories and talk about myself, what I always do, but I realized I needed to make it about other people. What I do in the book as I introduce a story and I tell what happened, and then I talk about how I felt about it. Then I set up a best case scenario or maybe what I wish would’ve happened. And then we finished that with points of ponderings. We make it in word for the reader and I talk about when have you had an experience that made you feel like that. It’s more of an educated guide to make people reflect on the privilege they have of being able-bodied, or if a person does have a disability, maybe they can relate to some of the things that talk about or some of the feelings I’ve had based on the experiences of being a wheelchair user. I’ve been working to promote it for the last year. Every single person that has read it says it’s amazing, really great insights. It’s a book for everybody, but if you have a disability you are really going to relate to it. If you don’t, gosh, it’s going to give you some insights into a life that you are probably unfamiliar with. I think is for everybody. JOSH ANDERSON: I was telling Matt before the show that I have begun reading it but with a tiny infant at home, I get to read tiny parts. When she sleeps, I try to sleep too. MATT GLOWACKI: Your baby is way more important than my book. JOSH ANDERSON: The little bit I’ve gotten to read I really enjoyed. That was one of the reasons I wanted to be able to talk to you today. Getting back to the ADA, let’s talk about where are the places where it’s continuously fallen short. MATT GLOWACKI: The challenges that I find have everything to do with maybe the social economic status of the area. If you are in a new and upcoming area, a lot of the ADA regulations are built right into new construction. Is not even an afterthought. It’s in the basic plan inherent to the design of whatever people are doing. But if I go to a historical place or an area in the United States that might be a little downtrodden, and if they don’t have a lot of money for the basic things, I don’t know where they would find the funding to handle all of the extra stuff. I can always do a little bit of a litmus test on the community based on how they handle the accessibility. The idea I lean on every once in a while is people that have the resources, they design using it. And then the people that don’t have the resources, when they see that I need it, they are the best people in the world to try to fix it in the moment. I think I’m an innovator, I think I know how to design stuff, but boy, I will never stop being surprised at how innovative people are when they know that there is a problem that they think they can solve. I appreciate the little bit of a challenge that they put on themselves and I really appreciate the effort. The problem that I find is I’m glad that they want to make the accommodation for me, but I have such a privilege of taking accessibility for granted because it has been 28 years since we passed the Americans With Disabilities Act. I don’t feel like you have to feel disabled by asking people for help 99% of the time, because the combination exists. But when I’m somewhere and it’s not there, and somebody is still trying to do their best by trying to fix whatever the concern is with the issue I have, and they are trying to make it accessible, at that point — again, this is the composition that exists in my mind — it runs me down a little bit. At that point, I can think to myself, I am disabled. One of the really big benefits of the ADA to me is that it takes some of the emphasis off of the nature of my situation and allows me to feel a little bit more normal. It allows me to participate with everybody else. Allows me to go into the front door rather than the back door and having people be surprised that I’m there. that’s what happens. I will come to the back door and somebody who doesn’t know that they are using — whatever, the kitchen or the utility ramp — they’ll come up and say how did you get here? I’m like, I used the ramp. There like, oh, okay. But at that point they focus on me, and at that point I’m just like, I just want to be invisible. I just want to be a regular person. The ADA has given me an expectation of accessibility, and it’s also minimized the impact of my disability on myself. That is something that I really want people to understand. What I’m looking for is normalcy. Of course normalcy is it different for every single person. Here’s a good instance. I was in downtown Milwaukee, and they had just completed a really beautiful Riverfront. Right along the river that goes to downtown because you can walk and they’ve got — it’s ADA compliant all the way through except at night, they turn off the lifts. I was with a friend of mine, and I had to walk down the area before. I’m going to have a nice romantic evening and all that stuff, and all of a sudden, my romantic evening was interrupted because the lift wasn’t open. They spent the money to have it, it’s supposed to be open, but for some reason it wasn’t. Now I had to make an excuse for why I have to change the environment and the feelings and everything. And then I have to focus on my disability a little bit. I have to go back and try to find a way to get around that and get to the place that we were trying to go. It amplifies my disability and makes me feel a little self-conscious about my disability. When something isn’t accessible, it makes it harder on people that I am with. I usually do my best to try and prevent the impact of my disability from acting on other people. I want it to be as easy for them to be with me as it can possibly be. Again, 99% of the time Because of the ADA, I really can live a very normal life when I want to go places and do things with other people. It’s a little bit of a challenge outside of the country, and they do travel international. The one that fooled me all the time is Canada. They do their best and I don’t a lot of changes and stuff like that. They do share fall short on the curb cuts. What happens is out go someplace, I’ll see something in a building that’s not accessible, and then in my mind I go, well where is the ramp? And then I go and we don’t have one because they don’t need one. And then it reminds me of what it was like before I graduate high school where all of a sudden I needed to lean on other people. I was looking for a favor. I was looking for an explanation. I was looking for a way out sometimes. I don’t really have to worry about that in the United States, but I sure do outside of the country. Canada is an awful lot like the United States and a lot of ways, but when it comes to the assumption of access, I certainly don’t have it. I was with a new friend a few years ago near Buffalo, and he was like, let’s go over to Canada and check the Canadian side of the falls. I was like, yeah, that would be great. As we were crossing the bridge, I realized I might need help. It was a new friendship and I hadn’t needed to ask that new friend for help to do anything yet because I’ve got a pretty good system in place for my life. It was weird because I looked at him and I said, I don’t know that I’m 100% having this conversation with you, but I just want you to know we are going into a foreign country that doesn’t have the Americans with disabilities act. What that really means is at some point, you and I might want to do something and I will be able to do it. I don’t want to prevent you from doing it so please go into it. But just know that there are a lot of times I have to sit out and I can’t have the same experience that you do simply because the rules onto the same in terms of accessibility. It was amazing. I didn’t realize he was going to be as good of a friend as he was in that moment. He looked at me and he goes, you know, I used to take care my grandpa. I must’ve carried him and his wheelchair up hundreds of stairs over the course of my life. Is not a problem. If you need anything, just let me know. All of a sudden, not only did I feel more comfortable because he met the conversation with a smile and a hand rather than, okay, I’m going to be missing out on something, but the best part was all of a sudden I went, that’s why we were such fast friends. It really never was about my disability with him, because he saw me as a person and didn’t see the wheelchair right away. It was a little awkward that I had to have the conversation, but he came through and now I understand why we were such fast friends, because he has some experience. It is always on my mind, what do I have to do to try to normalize under the person’s relationship. If there is something I ever feel insecure about, it’s a version of not being enough for another person simply because my situation might prevent them from doing something that they really want to do or that they enjoy. I would never want to have that happen. The ADA strengthens my confidence in relationships. It gives me an understanding of access, and assumption of access that I didn’t have before. But what I really did is it allows me to be more of myself. Whether it is good or bad, it actually allows me to forget that I’m disabled a lot of the time, because I don’t have to worry about it because the changes have been implemented. I get to take advantage of them everyday. JOSH ANDERSON: I think you touched on a lot of great points. One of them I differently heard is yeah, it makes everything not just able to include everyone but takes away a lot of that stigma. If you are in a busy area and you look at the curb cuts, every able-bodied person walks out of the way to use the curb cut as well without even thinking about it. MATT GLOWACKI: All the time. again, it’s universal design, that’s the conversation that we are having. Don’t do it for me could do it for everybody. The amount of people that I’ve seen that take advantage of the curb cuts are the accessibility, or even the door openers. I’m a firm believer that we should have Star Trek doors on every single doorway that we go through. I don’t know why we have to ever open up a door manually. When able-bodied people use the buttons, I don’t hold it against them. I think just because it has a name on it or a simple, that a represents disability and a good or bad way. I don’t think it should just be for people with disabilities perk I think everybody should use it. What we are looking to do is make everybody’s experience better, not just necessarily a group of people. If we do things to help out people, then I think we are you reinforcing what you said is the stigma of having a disability. I want people to interact with me and be with me and talk to me like everybody else point I don’t want them to have to put their “Okay, I’m talking to a person with a disability” hat on, and tried to say all the right things. I don’t want it to be work to be with people perk I just want to have a relatively similar experience to what they’re having so that we can get to the important stuff and not the stuff that’s on the outside. JOSH ANDERSON: Where do you see the future of access? MATT GLOWACKI: That’s a great question. JOSH ANDERSON: I know it’s a big question. MATT GLOWACKI: I’ve got a couple of ideas on this. You said at the beginning that we are not much on the politics, and I totally understand and agree. But I think right now, our country has some spending challenges. I think one of the benefits of us having almost unlimited resources for doing good work is that there is funding for the ADA accommodations. I’m really worried that at some point, that funding is going to have to be cut because we are going to have to tighten our belts all around. At that point, I am a little worried. If the train stopped running, they’re not really going to be worrying about trying to get a ramp for the train. They are going to accommodate the most amount of people. That is what we can do to get the trains running for the least amount of money that we can possibly get them running. Right now, we might be in the Golden age. Of course technology is going to get better so the accommodations we can use are going to get better. But at some point, I don’t know that it’s always going to get better. I’m also interested in this virtual reality thing. At a certain point, people are already staying inside. People don’t want to go outside. All the deliveries, food deliveries, people want to be at home. They can have almost an outside experience by doing things on the computer and doing things with virtual reality. At some point, I think for the few people who can’t take advantage of the competition that are already legally guaranteed by the ADA, I think some people who might not have had the freedom to go outside for resources or whatever the challenges might be, I think they might be able to have a fuller life through virtual reality than they are having right now. But I’m also concerned that I think everybody might just stay inside. So the accommodations that we are talking about probably should be focused more on the home and the environment that people are spending the most amount of time in, which is their house, compared to outside. I think the virtual reality thing is going to be the next big difference maker in a lot of ways. Especially in my job. I kind of think I might not have a job in 10 or 15 years because what makes people interested in listening to me is the fact that I make a pretty strong visual statement. I don’t have legs and I’m using a wheelchair. When I walk into a room, I’m the most interesting thing that just happen. If it’s a restaurant, people put their spoon down. If it’s a class, everyone stops learning and look at me. I trade on that. That’s one of the benefits that people are interested in me and my messages. But if we go virtual reality, why should I portray myself as a person with a disability? Virtual reality is the ultimate leveling force. You can use any avatar that you want to represent yourself in any way. The future of the ADA, the future of accessibility, I’m a little worried about it but also have great hope that with the advent of virtual reality, it’s going to give access to people that haven’t had it before to go places and do things they never been able to do because of a limitation with a disability or financial. I’m excited about going out and having the adventure. JOSH ANDERSON: Very cool. If our listeners want to find out more about you, where would they go? MATT GLOWACKI: The easiest place to go is my website, MattGlowacki.com. I’ll spell it real fast, M-A-T-T-G-L-O-W-A-C-K-I. but I pay Google, if you google “Matt no legs” or “no legs Matt”, both of those searches will take you to my website as well. It’s only easier to remember. If you’re interested in more stories or stuff, book is a good place to find those stories as well. JOSH ANDERSON: We’ll put links to both those in our show notes. Matt, thank you so much for coming on our show today and talking about the ADA. MATT GLOWACKI: I really prefer the opportunity. If you ever want me to come back and hear some more funny stories or insights, I’d love to do it. It’s been the greatest experience. Thank you for giving me the opportunity. JOSH ANDERSON: We will definitely have you on again.